Supro was a budget brand name for amplifiers produced by Valco in Chicago, IL during the golden age of tubes. The same model of amplifier could be sold as a Gretsch, National, or Airline brand (through the Montgomery-Ward catalog). Valco manufactured amps are now highly sought after and have increased in price accordingly. Jimmy Page reportedly used a Supro amp while recording Led Zeppelin's debut album and other guitarists have also employed the small combos in the studio for searing electric blues. In April of 2002, these amps were featured in the ToneQuest Report. The original Supro 16T circuit design is similar to other single-ended Class A amplifiers from the period, but subtle differences are present. The filter network following the first stage rolls off bass and treble content where the tonestack of a Fender Champ or Princeton normally resides. The Supro's single Tone control is placed after the second pre-amp stage. Thus, more high-end signal is present to drive the second stage. Also, there is no use of negative feedback to reduce distortion. This circuit produces a wide range of sounds that do not sound much like the Fenders, Voxes, and other famous names; it has it's own character and identity. More information about the circuit can be found on the Runoffgroove website. Built his tonight, had to add a couple of rows to accommodate my trimmers so moved the trace cuts accordingly, for some reason I'm getting continuity along tracks 2&3, I know thes are linked but I'm getting continuity from end to end,it's like the trace cuts don't exist, basically I'm getting continuity across the 3 drains, I've redone the cuts almost to the point of dilling through the board but it's still there. Weird. Can you take a couple of high res pics and post them or email them to me? Is the JHS Superbolt based on this? $200 is a heavy price for a simple OD so if I could mod this to sound like a superbolt that would be awesome. And why does it seem like no one in the entire internet has reverse engineered any jhs pedals? It probably is based on this when you weigh up everything we know about it, but it hasn't been confirmed yet. No doubt it will be shown one way or the other over the coming months when someone on FSB gets a proper look inside one. I don't think anyone is really interested in reversing JHS pedals, all the ones I've seen so far have been at best slightly modified versions of a pre-existing design and so I don't think many people on places like FSB want to pay the admission to see something we've all seen before. I'm not criticising Josh at all, very few pedals you see now are anything we haven't already seen before, but when you expect it from some builders you don't have much enthusiasm to reverse it when there are much more interesting options out there to concentrate on. I just finished this one up and I'm not really getting a lot of gain to work with. It's feeling a little like a clean boost at this point. 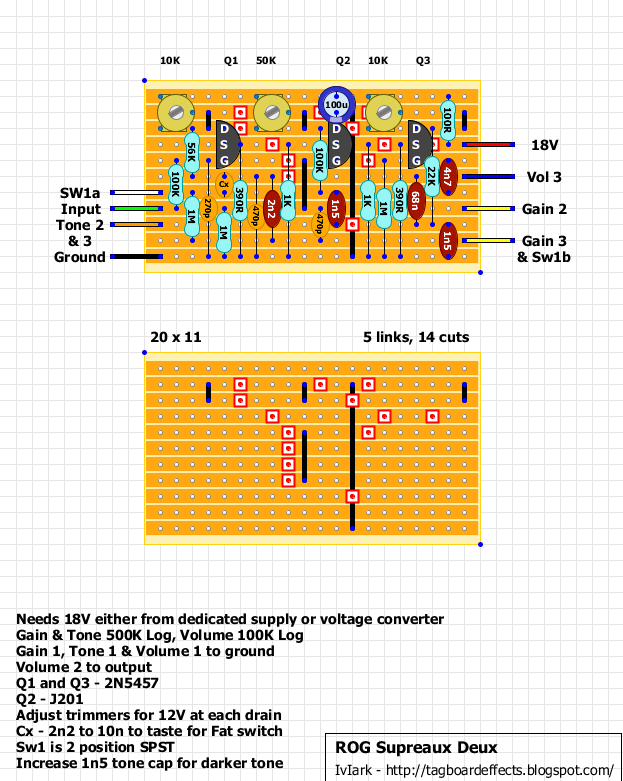 I used 4001's on the voltage doubler but I wouldn't think that it would make a huge difference or maybe I'm wrong. If I fiddle with the internal pots I can get a sort of blown speaker sound but not fully what the demos on ROG sound like nor even close to the superbolt which was what I assumed this was a clone of. Any suggestions? Woops! After some more checking the charge pump was getting around 7v to the board so... I've found the issue haha. I'll report back once everything is up and running more effeciently, I may possibly switch out the 4001's to see if it will make a difference at all. Thanks again for all the layouts lvlark! Got it up and running finally! I would say compared to the SuperBolt demos it comes pretty close. If you fiddle with the internal pots you can really dial in a unique sound and get that blown speaker tone. This thing was a lot of fun to fire up and I did get a noise complaint from my neighbors (whether good or bad I couldn't tell you). I think there is a possibility that they may use different transistors or have the drains set differently be cause I couldn't quite hit what the superbolt was doing but awfully close I would say. If anyone has input on different transistors to try that would be great because my knowledge is somewhat sparce. This is a great sounding circuit. I dig this one a lot! and i just realized my "fat switch" is not working. has anyone verified this and the fat switch to work?? i thought i remembered it working, but i just changed the capacitor and checked all my connections to the switch. everything is looking good... maybe it was my old guitar that made the fat switch more noticeable? What value did you use for Cx? The switch just adds that cap value to the 2n2 which is part of a high pass filter with the Gain pot. So the frequencies it works on depends on the position of the gain pot, but assuming it's set for full gain, the 2n2 on it's own will start attenuating bass from 144hz which is pretty low anyway, so if Cx is a 2n2 that frequency would halve to 72hz. That isn't a total cutoff point though, it's just the point below which the frequencies are attenuated, half the cutoff frequency means the signal would be half the amplitude so you would still get some lows there but they would be reduced. Maybe decreasing the 2n2 in the board would be a better idea to make the sound thinner stock, which can then be countered by the value of Cx to give you the full range. Why are there 2 1K resistors between the source pin (S) of Q2 and the ground? Wouldn't the 2 in parallel be only 500 ohms? The original schematic shows 1K between the S of Q2 and the ground. Before I build is this ok? Hmm. There should be only one. Mark's out of town, so we should wait for his input. any chance of getting a layout for this with an 18v voltage converter on the same board? :) Thanks! Built this, and it sounds really nice. But I'm getting a great deal of white noise behind the great sound as I turn up the gain pot. Is this normal? Please forgive this very very stupid question, but the smaller yellow caps, such as Cx, 470p... Are those ceramic disc? Tantalum? Thanks so much... this site is amazing! Thank you. You guys are all nice, extremely helpful, and FAST! Can't wait to build this guy. for some reason I can't get the drain on the far right transistor down to 12V. The lowest I can get is 13.9V. I was able to get the others to 12V with no problem, but even after I tried a different 10k trimpot I'm still not having any luck. Has anyone else had this problem or know what may cause this to happen? I'm not sure how close to exactly 12V they have to be set, but right now the effect is pretty dark sounding and quite farty. hmm something definitely isn't right. I put in a 50k trim pot and got all three transistors set to 12V but it still sounds farty and way too dark. I'll try removing that extra 1k resistor and see what that does. Well that doesn't fix it either. the superbolt sounds more like the original supreaux to me. So sorry for filling up this thread but I have some good news! I built the original Supreaux, added the fat/boost switch and it sounds amazing! I decided not to try to modify it to run on 18v because it has plenty of gain/volume the way it is. The 18V gives it more headroom so you can get cleaner tone with more volume. Okay, I'll try to make this my last stupid question for this build... but to check the voltages on the trimmers (to set them to 12v), where should the tips of a multimeter be held? Do you ever start to think maybe you're going crazy? I built this and tested it. I got a pretty good distortion... With a few major problems. The biggest problem is that I can't get any of the trimmers below 18.8v. I checked the voltage of my 9v power adapter (which I've had and used for years - always assuming the output was actually 9v), the DMM reads 14.5v... Okay, that's confusing... I get a voltage reading of 13.7v at "9v IN" on the voltage doubler board, which gives me 27.2v OUT of the doubler board (so the math seems to add up as far as doubling goes)... The same 27.2 is measured at the "18v IN" on the Supreaux board. As a lesser problem, the tone control has no audible effect, but I figure it's not really worth troubleshooting the sound until I know the board is functioning properly, as things tend to work themselves out once you fix bigger problems. Any help or advice you guys might have would be greatly appreciated. Well I connected a 9v battery to the DC Jack. Set the trimmers to 12v. Replaced Cx with a larger cap, and now I have no output. It's turning into one of those tear-your-hair-out projects. I went a little crazy today, took everything off the board, and placed everything on a shiny new vero. All soldering is now new, and I see no bridges. Swapped out the new Cx cap for a new one in case it was defective. Still nothing. I'm totally stumped. The solder on the back is a little sloppy, sorry for the random solder spots. But anywhere it looked like there could be a bridge I cut the board. Try another batch of transistors, in case you haven't, in case you haven't... also check all the resistors (including pots and trimmers) with a DMM to make sure they are all the correct values. Anyone getting lots of white noise with their build? Everything works fine and sounds great, but I'm getting lots of white noise in the background, like an old fuzz turned up all the way. hello guys i just built a clone of jhs superbolt with a help from my friend and we'd discussed a lot about this pedal where I found that the jhs superbolt based on superax deux pedal. so i found that mine more like a clean booster and to get that nasty drive sound i have to put the volume knob way up to 5 clock. any suggestion? here is the demo...well i took the video with a tab camera. the sound on the video was a bit distort because the lack of audio quality. AFAIK, the JHS clonage has more to do with the Supreaux I (which is brighter and gainier) than the Deux, the major difference being that he got the 18v converter idea from the Deux and used it on his Supreaux clone. Finished this up last night. I'm finding it pretty dark - I have to keep the tone control maxed out on the treble end and it's still fairly dark. And I play single coils for the most part. Fairly low gain - definitely doesn't sound like the Thunderbolt clips I've heard. I'll mess with the trims and see if biasing differently helps at all. It's ok as is. Just a little underwhelmed. On to the next! I agree about the darkiness of the pedal and I also play it with the TONE maxed out. Looking for a way to brighten it up a bit. Great overdrive by the Runoffgroove team. Built it and played with it a lot. Great after a fuzz too, of course. Re-boxed it with a better hammond style enclosure. Ready to rock now. Nonetheless, after listening to the first Supreaux version I think I would like to modify the Supreaux deux to be brighter and crunchier. Any ideas? 1. 22nF in series with the input. 2. 9V on drains instead of 12V. 3. smaller output cap in series with output. So I am kind of new to pedal building. I have less than 10 pedals under my belt. My question is how do i set the drains to 12v? Like do i solder them on the board first one at a time and test the voltage? or do i hook it up to my 18v off the board for each one? Hi. I'm having troubles with this.